This is Part 3 of a multi-part series. Part 1 was with Dennis Mitchell. Part 2 was with Brooks Johnson. Hurdle touchdown times are the Holy Grail to coaching hurdles. There are many ways coaches interpret data, and all you are looking for is IMPROVEMENT over time. I talked about how Sally Pearson is aiming for a 0.27 flight time for ALL 10 hurdles. If she did that on her last 12.28 race, she would break the WR of 12.21. Another method of Hurdle touchdown times is identifying the weakest part of the race. Yesterday’s post with Brooks Johnson spoke about adding 5.5 seconds to your 60 meter hurdle time and that would get you a medal at a major championship. 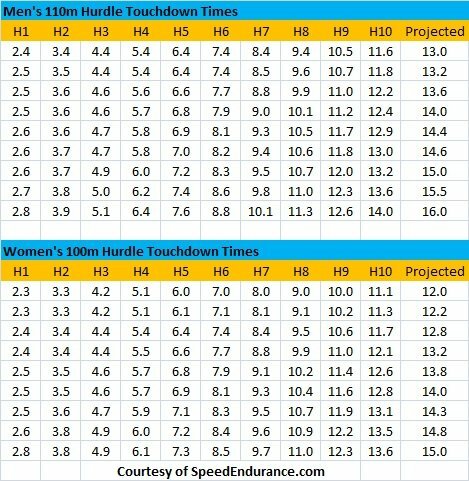 Before I show you a live workout on how elite track and field hurdles use touchdown times, I want to go over a bit of theory and how I used it identify and classify athletes. It’s also a performance indicator so just because you run a certain split, doesn’t mean you can extrapolate that for the end result. 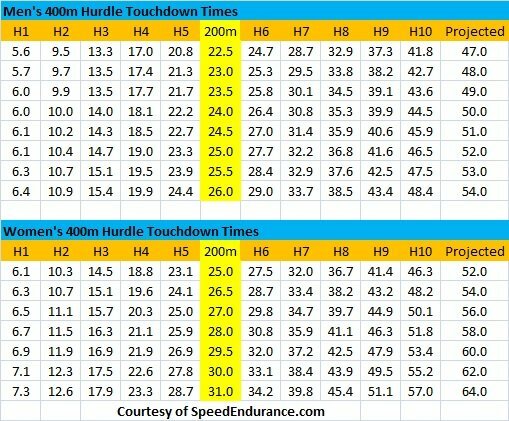 Here is my video on YouTube and I explain how I use the hurdle touchdown times early in the year. For the sale of clarity, I added the charts here, and more information on Freelap can be found at FreelapTrackandField.com. Part B tomorrow will show other methods on using hurdle touchdown times wisely.